Are You Looking For A New York Bicycle Accident Lawyer? Our NYC bicycle accident lawyers recently settled a case for a woman on a bicycle who was injured after being struck by a bus in New York. The video was obtained from the defendant bus company during discovery. Bicycles are a common means of transportation, recreation and exercise throughout New York. 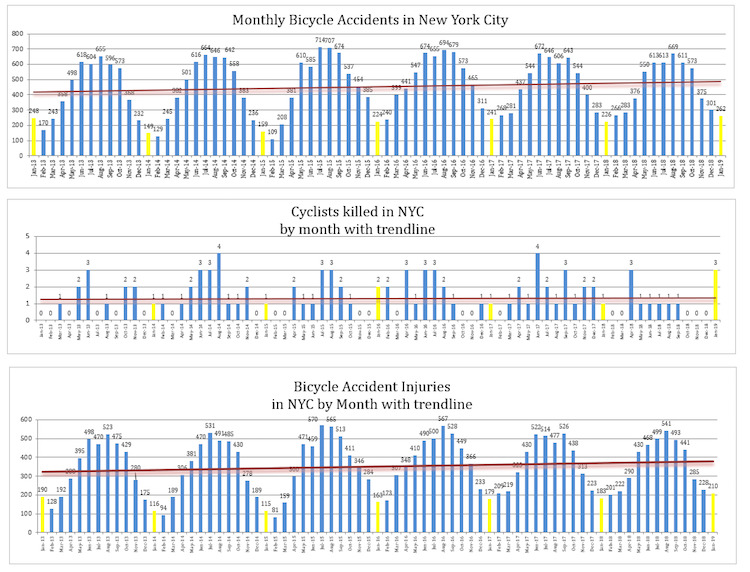 Bicycles offer very little in terms of protection from the hazards confronting a bicyclist on the roadways of New York. This can, and often does, lead to severe and catastrophic injuries to bicyclists when an accident occurs. Unfortunately, a large percentage of persons injured in bicycle accidents are children. Persons injured in bicycle accidents face unique legal challenges under the laws of New York which require specific knowledge and experience as it concerns the rights of bicyclists. Our New York bicycle accident lawyers have years of experience representing victims of bike accidents and their families in all 5 boroughs of New York City and beyond. Our attorneys are specialized in handling catastrophic bicycle accident cases and have recovered multi million dollars settlements and verdicts for their clients. Our firm was featured in the New York Law Journal’s Top 25 New York Verdicts of 2014 for obtaining the highest award for a verdict in a motor vehicle accident involving a bicycle. GGCRBHS&M was also named 2013 Law Firm of the Year Personal Injury Litigation and a Tier 1 firm in New York City for Personal Injury Litigation - Plaintiff in 2014 by U.S. News – Best Lawyers ® “Best Law Firms”. 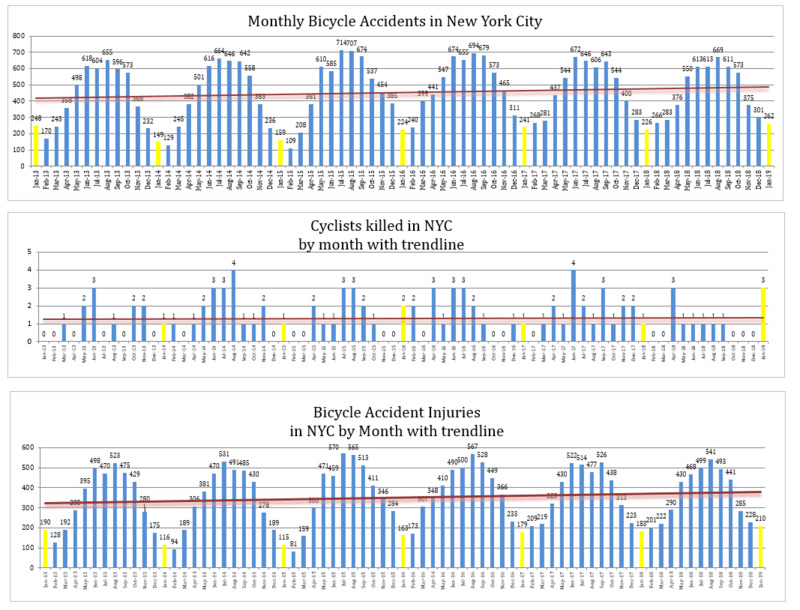 The majority of bicycle accident cases in New York involve contact with a motor vehicle that failed to yield the right-of-way at an intersection, or unexpectedly turned into the path of a cyclist, often making left turns in the path of an oncoming cyclist, or a motorist overtaking a bicyclist, often by misjudging the space needed to safely pass. Too frequently, motorists, including trucks and buses, cause bicycle accidents by failing to share the road, forcing cyclists off the road or into a collision. Bicycle accidents also occur due to other factors which are often unique to the operation of a bicycle. Bicycle accidents often occur due to environmental factors such as defective roadway design or maintenance, impaired visibility and poor road and path conditions, including potholes, road debris, maintenance problems, and even dog attacks. An all-too-common scenario in New York is when a negligent motorist opens a car door directly into a cyclist's path. Another scenario somewhat unique to New York is that of a pedestrian struck and injured by a bicycle messenger or delivery person. Bicyclists must observe the same rules of the road and be accorded the same rights as the operators of all other vehicles pursuant to New York State Vehicle and Traffic Law § 1231. However, a bicyclist is considered a pedestrian under the No-Fault Law in New York and is, thus, entitled to No-Fault coverage under most circumstances. Bicyclists are also subject to various helmet laws codified in New York Vehicle and Traffic Law §1238. In New York, a child under the age of one year is prohibited from being a passenger on a bicycle. Passengers and operators under fourteen years of age are required to wear protective headgear. All other bicyclists are not required to wear a helmet. It is also important to fully understand what the helmet is designed to protect. For an impact at speeds in excess of 15-20 miles per hour, a bicycle helmet is less likely to prevent a serious head or brain injury. Under US standards bicycle helmets are tested in 2 meter drops that achieve about 14 miles per hour (22.5 kph) on a flat anvil. In a famous article in the New England Journal of Medicine, it was determined that wearers of bicycle helmets had an 85% reduction in their risk of head injury and an 88% reduction in their risk of brain injury. A Case-Control Study of the Effectiveness of Bicycle Safety Helmets , Robert S. Thompson, M.D., Frederick P. Rivara, M.D., M.P.H., and Diane C. Thompson, M.S. N Engl J Med 1989;320:1361-1367, May 25, 1989. The NYC bicycle accident attorneys at Gair, Gair, Conason, Rubinowitz, Bloom, Hershenhorn, Steigman & Mackauf advocate for their clients' full financial recovery through detailed, meticulous preparation for trial. $ 8,570,000 verdict for a 36 year old bicyclist who suffered personal injury after being struck by a bus in NYC. Read more about this case here. $5,500,000 settlement on behalf of a bicyclist struck by a New York police car which was pursuing him. $5,000,000 recovery in New York County for the widow of a doctor struck and killed by an NYPD tow truck. The decedent was riding his bicycle on the Green Way on the West Side when the truck made a right turn on to the path and crashed into him. The decedent was not wearing a helmet. See below video to learn more about this case. $1,200,000 verdict for a woman who, while riding her bike suffered a lower back injury (herniated disc) after being struck by a car. If you have suffered a serious injury or a loved one died as a result of a bicycle accident, please Contact our personal injury law firm to discuss your case. Our New York Bicycle Accident Lawyers obtained the highest verdict in 2014 for an accident involving a bike and another vehicle. This is also the 16th highest verdict of all New York State verdicts in 2014. It was also listed in the 2015 New York Law Journal’s New York’s Verdict & Settlement Hall of Fame.